The Breville Die-Cast Citrus Press Citrus fruits come in all shapes and sizes. So how do you juice the smallest lime or the largest grapefruit without switching cones? 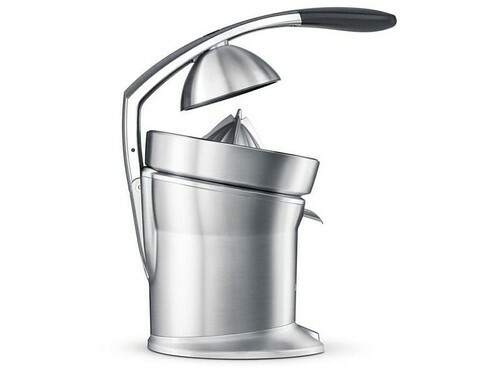 This Breville citrus press is designed to maximize juice yield from all types of citrus. A uniquely finned cone extracts juice all the way to the rind, regardless of size. A. Juice Press Arm - Patented juicing handle features a unique triple hinged arm to ensure downward pressure throughout the juicing process to maximize juice yield. B. Stainless Steel Filter - Dishwasher safe. 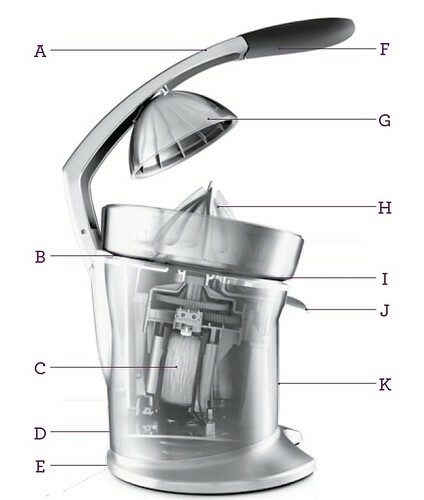 C. Powerful Motor - Automatically starts when pressure i applied to the Juicing Cone. D. ON/OFF Button. E. Cord Storage - wraps around and clips into position under Motor Base(not shown in picture). F. Soft Grip Handle - makes juicing easy. G. Fruit Dome. - is easily removable for cleaning(dishwasher safe). H. Die-Cast Stainless Steel Juicing cone - uniquely finned and undulating cone extracts the maximum juice from all sizes of citrus fruit(dishwasher safe). I. Juice Collector - collects the juice to flow out the Juice Spout(dishwasher safe). J. Juice Spout - opens all the way for cleaning with anti-drip stop function. K. Double Stage Switching System - juicer will NOT operate unless it is correctly assembled for safety and performance.